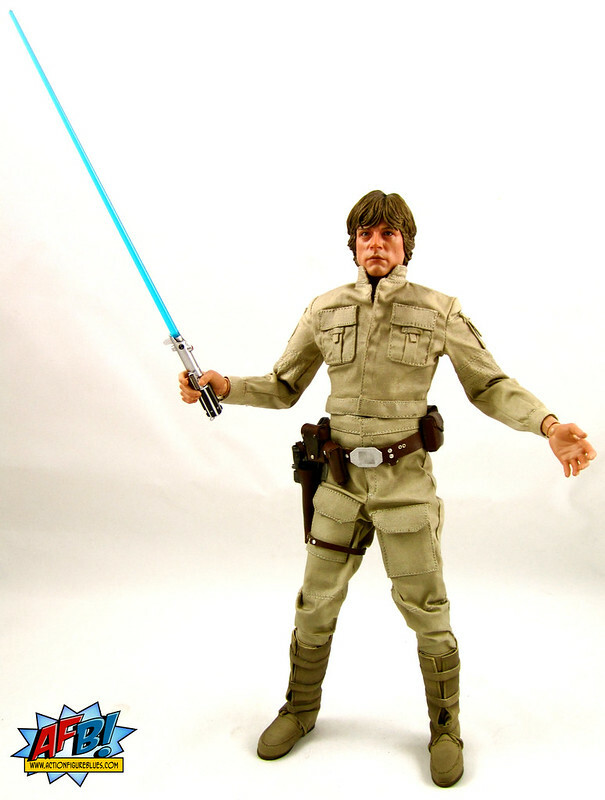 It’s been more than a year since Hot Toys announced that they were going to produce Star Wars figures in 1:6 Scale, and that the Hot Toys Star Wars Bespin Luke Skywalker would be the first figure in the line. It’s been a long wait for the release of this figure, but after a bit of delay it’s now hitting the shelves. I was lucky enough to be home today when this delivery arrived, and I am quite sure the delivery driver thought I was more than a bit mad as I really couldn’t contain my excitement to be receiving this much-anticipated item. First off, let’s just say this was well and truly worth the wait. Hot Toys couldn’t have made a better start to their Star Wars line. I honestly can’t remember the last time I’ve had so much fun and so many geeking-out moments while unboxing and photographing a toy. The immense quality of the product aside, a large part of this giddiness has to do with the nostalgia element, and I think this is going to be a figure that brings many collectors into the Hot Toys fold. 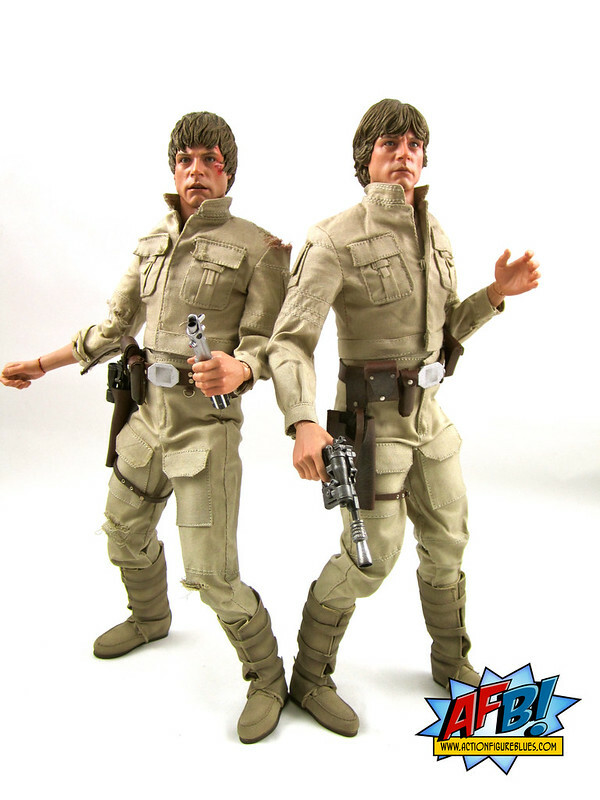 We’re quite used to seeing swap-out heads and multiple hands and accessories with these figures, but with the Bespin Luke release Hot Toys have taken this to an entirely new level by including two entirely separate figures in this set - regular Luke and Battle Damaged Luke. It’s a real credit to Hot Toys that these figures can be displayed alongside each other - I for one am not great with lots of swap out pieces and am happy to pay the extra cost for another True Type body to be able to have the whole set on display. The likenesses on both of these figures are excellent. I’m not quite as sold on Battle Damaged Luke’s likeness, mainly because the hair is a little off. The hair on both of these figures is removable in order to operate the PERS eye movement system, and while this is a great feature I think that the separation of the hair and head makes the hair piece a little thick and therefore not quite as natural looking. I’m still a bit gun-shy about using the PERS much - mainly because I fear them getting stuck in some sort of horrible cross-eyed frozen pose, so that’s all a bit lost on me, but it is a very clever feature that takes these toys beyond glorified Ken dolls to something collector-worthy. 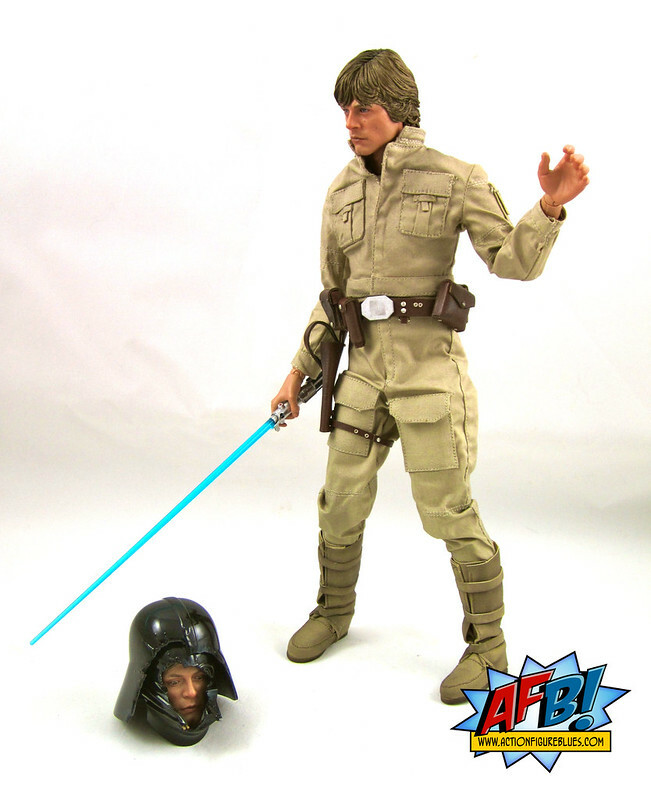 Regular Luke and Battle Damaged Luke sport the same base outfit in “before” and “after” states, and impressively each have all of their own pieces and accessories. The basic jumpsuit is great and very nicely constructed, with great wear and tear for the Battle Damaged version. There is some great detail in the pockets and seams, and the boots on these figures are beautifully constructed. My only complaint with the clothing is that the jackets tend to ride up a bit and create a collar that is too high and overwhelms the neck. 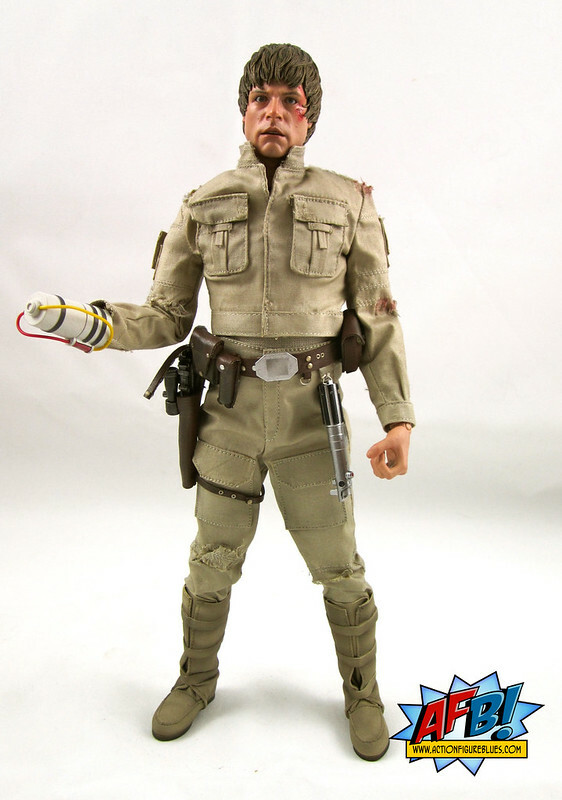 Very impressively, each Luke has his own blaster and his own complete belt with holster and all accoutrements. The only thing that the two Lukes have to share are the lightsabers in this set. There are one each of “off” and “on” lightsabers. One thing about the minute detail that Hot Toys goes to with its pieces is that I always seem to have something break or come apart when I’m unboxing these toys. In this instance, the hook that you can hand the “off” lightsaber on came off of Regular Luke’s belt as I was connecting it. I think this can be easily repaired - as long as I don’t lose the tiny thing first! 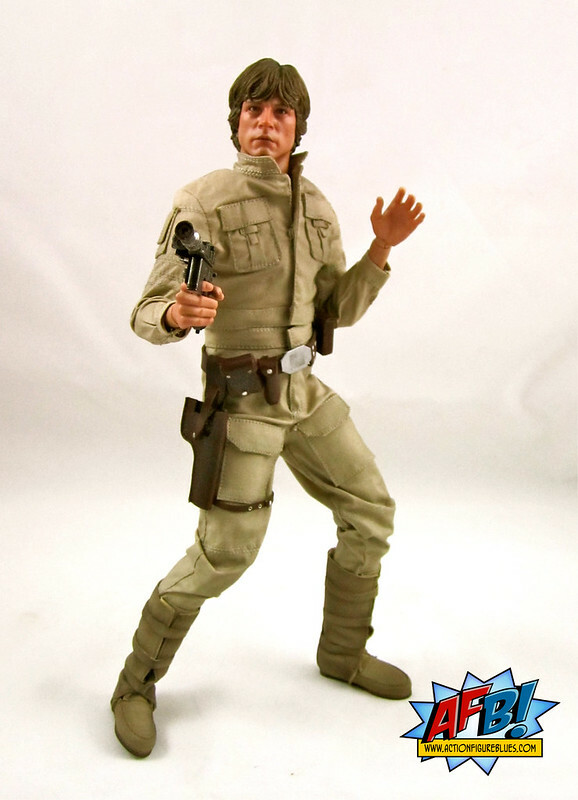 Of course, Battle Damaged Luke isn’t really about some torn clothing - it’s all about the stump. This has been incredibly done, with a number of options for display. 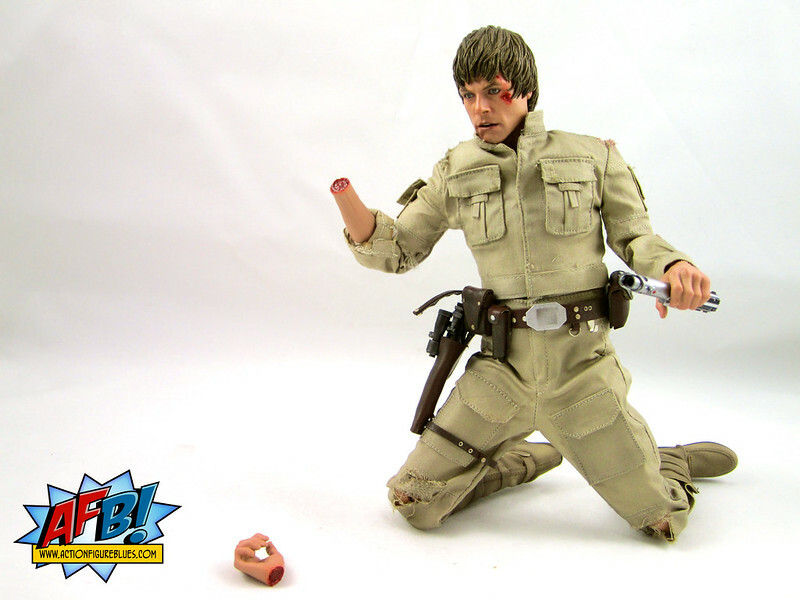 Battle Damaged Luke comes with a complete right arm, and then a swap-out stump. This was actually quite easy to do once I looked at the construction of the inside of the stump arm - it takes a bit of bending with firm, steady hand, but the material is flexible enough to remove the complete arm without needing to heat it. One the complete arm is removed, you can attach the regenerator to help Luke start to heal, or you can attach the stump and really have some fun! One great touch which I wasn’t expecting is the inclusion of the severed hand with connects to the stump wrist with a magnet. This is simply super fun - and you can’t help but have some silly fun and games with the whole stump scenario - the severed hand is such a great inclusion! This is the Sideshow Exclusive version of the figure, which comes with the very creepy “Luke’s face inside Darth Vader’s decapitated head” extra piece. It’s very well done, and comes complete with a bloodied stump on Darth Luke’s neck. A very fun and beautifully crafted exclusive inclusion. I haven’t photographed the large diorama with light-up features that comes with this set. At present I won’t be displaying this piece - I have a move coming up in the next few months and no real Star Wars space as yet - and so I thought it best to leave the diorama pieces in their original state until I’m ready to have it on display. From all the photos I’ve seen, it’s huge and supports the weight of one of the figures. Definitely something I’ll look forward to having on display sometime in the future. The one surprise in all of this for me is that as yet we don’t know what is coming next for this line. Hot Toys have said that this is line they want to get exactly right, and indeed if they continue such a deluxe format of delivery it will be good to be able to spread the cost out, but I’m hopeful for some news on the next character soon. Having recently jumped off the Hot Toys bandwagon for superhero movie toys, mainly because the volume and pace of the output was too much to keep up with financially, I think a line like this is going to be much more my speed, and the collecting the most iconic versions of these characters at this level of quality is something I can very much see myself getting into. The Sideshow Exclusive version of this figure is still up for order at Sideshow. 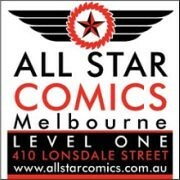 If you haven’t grabbed one already, I would recommend doing so quickly - I can’t imagine this staying in stock for long! Damn, you're going to make me buy this, aren't you?